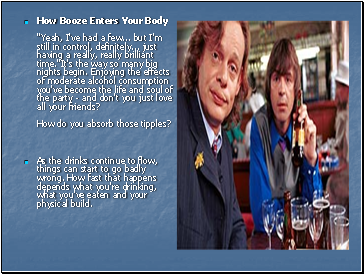 How Booze Enters Your Body "Yeah, I've had a few . but I'm still in control, definitely . just having a really, really brilliant time. "It's the way so many big nights begin. Enjoying the effects of moderate alcohol consumption you've become the life and soul of the party - and don't you just love all your friends? How do you absorb those tipples? As the drinks continue to flow, things can start to go badly wrong. How fast that happens depends what you're drinking, what you've eaten and your physical build. There are plenty of words to describe it: bladdered, slaughtered, mullered, legless or as drunk as a skunk. Call it what you will, if you keep drinking beyond the early warning signs you're heading for trouble - trouble focussing, trouble speaking, trouble keeping upright.For that classic sitcom moment, the thing to do at the end of the evening is fall off the barstool. 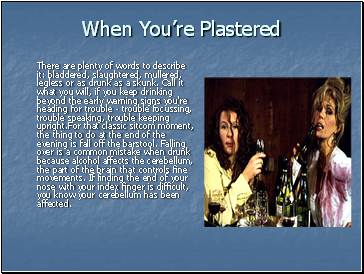 Falling over is a common mistake when drunk because alcohol affects the cerebellum, the part of the brain that controls fine movements. If finding the end of your nose with your index finger is difficult, you know your cerebellum has been affected. 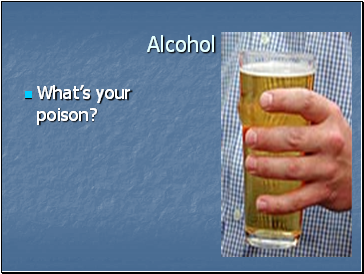 Blotto Researchers think they know why inebriated people sometimes pass out. When people stand up their blood pressure drops and a sober body responds by tightening blood vessels. 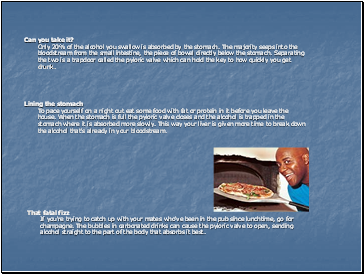 After knocking back a skinful, this system no longer works, which is why standing up to leave can induce a faint. 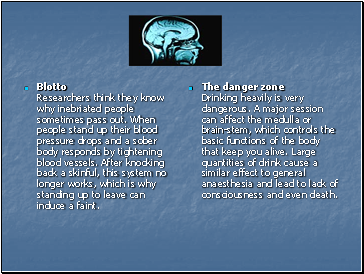 The danger zone Drinking heavily is very dangerous. A major session can affect the medulla or brain-stem, which controls the basic functions of the body that keep you alive. 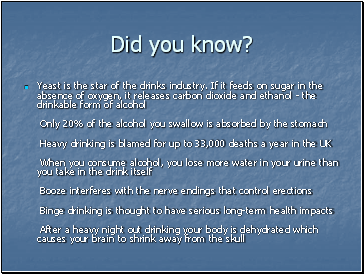 Large quantities of drink cause a similar effect to general anaesthesia and lead to lack of consciousness and even death.